Today I popped down to Westfield to check out Mary Portas’ charity shop or Mary’s Living & Giving Shop, to give it the official title. It’s situated in the swanky ‘Village’ area, which houses the designer brands such as Louis Vuitton, Miu Miu and twenty8twelve. It will be there until the 27th June and it really is a brilliant idea. Everyone loves finding a bargain in a charity shop, except these finds won’t be your average crusty old lady skirts. Mary has used her industry contacts to ensure there are daily donations from the best of fashion and celeb circles. Grazia magazine, who are sponsoring the project, had a good old clear out of the fashion cupboard by the looks of things, there are Topshop press samples (including MAJORLY reduced boutique pieces), donations from buyers, Henry Holland, Pet Shop Boys, Hannah Marshall and Luella to name a few. And seeing that tomorrow is being referred to as ‘Louboutin Tuesday‘ and Saturday as, ‘Super Saturday,’ due to the amount of designer goodies that will be on the racks, it’s worth popping down more than once, as the stock is always replenished as new amazing donations pour in. The money raised will go to Save The Children, Barnardo’s and Mind charities and a lot of money is being raised, with the shop averaging a very impressive 5k per day. 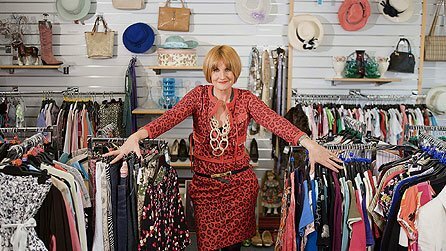 This shop is in conjunction with Mary’s Tuesday night BBC2 programme, Mary Queen of Charity Shops, which aims to change the nations attitudes towards charity shops. Apparently some people have a negative take on them?? I’ve been a long advocate of them and the gems give you if you take the time to look hard enough. Make sure you get down to Westfield at some point and grab a designer piece at a bargain price. Make sure you pop to your local charity shop too.